The phrase “jobless recovery” entered the capitalist lexicon in 2002. But since then nobody want to be associated with these phrase. Although a lot of economist tried to use this term as a byword. Still noboy want to own up to this infamous phrase. The term “jobless recovery “ had been associated with the terms of momentary statistical growth and corporate profits on books of accounts and in the stock market rather than in terms of production, employment and improvement of the people's living conditions. 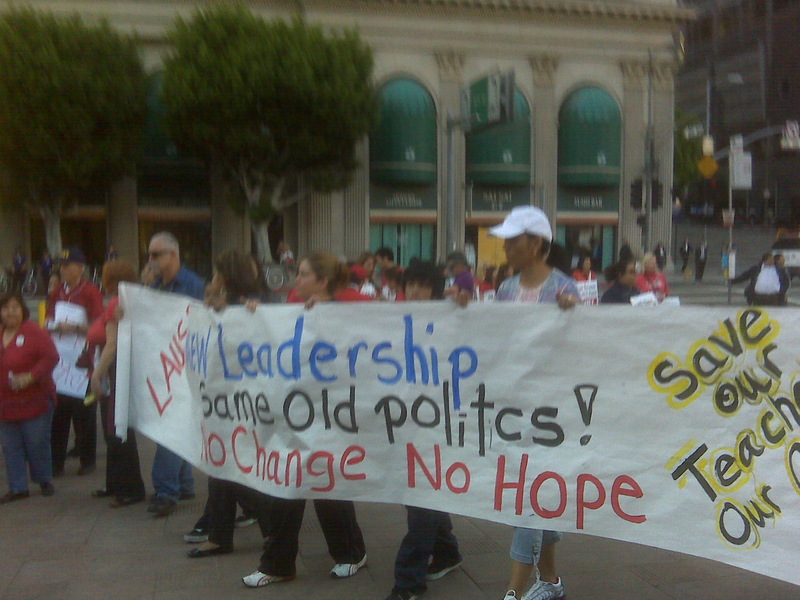 Los Angeles—The phrase “jobless recovery” entered the capitalist lexicon in 2002. But since then nobody want to be associated with these phrase. Although a lot of economist tried to use this term as a byword. Still noboy want to own up to this infamous phrase. The term “jobless recovery “ had been associated with the terms of momentary statistical growth and corporate profits on books of accounts and in the stock market rather than in terms of production, employment and improvement of the people's living conditions. According to ILO figures in 2009, global unemployment increased from 178 million in 2007 to 239 million in 2009, which is the highest level ever recorded. Of course, these official figures grossly underestimate the true extent of the jobs crisis by excluding the unemployed workers who have stopped to apply for jobs or who are on so-called retraining programs and by not taking into account the fall in the quality of jobs and the decreases in working hours and pay (casualization and part-timing). The capitalist global economy, measured in world real gross domestic product (GDP), contracted by more than 2% last year despite claims of a return to positive growth since the last months of 2009. Such spurious claims have been conjured through some US$11.0 trillion of public money doled out by states as bailouts to their giant monopoly banks, investment firms and manufacturing firms in quick reaction to the financial collapse in late 2008. The US illustrates well how corporate profits and upper class wealth, not jobs, are at the center of government claims to economic recovery. US real GDP began to contract from the start of 2008 to the first quarter of 2009 by as much as 6.5%. The government began a massive rescue effort to try to stem this decline and to date has spent, loaned or at least committed to spend or lend if necessary over US$13 trillion, an amount almost equivalent to the value of US GDP for an entire year. US GDP growth turned positive in the third quarter of 2009, peaked at 5.6% in the fourth quarter, but quickly started slowing down again to 2.7% in the first quarter of 2010. US corporate profits correspondingly increased by 7.7% in 2009 and then by a massive 56.5% in the first quarter of 2010 to US$1.6 trillion (from US$1.2 trillion in the first quarter of 2009). These levels are unprecedented and clearly unsustainable. In the advanced economies, gross general government debt averaged around 60% in the years before the crisis, reached 75% in 2007, and are certain to breach 110% by 2014 at the latest even if the temporary so-called stimulus measures are withdrawn. The Group of Seven (G-7) debt-to-GDP ratios are already near 100% which approaches levels immediately after the Second World War yet without the prospect of a post-war reconstruction boom to drive recovery. The raging global jobs crisis worsens even as profits have risen and the rich keep getting richer. The richest one percent of the world's households have even increased their wealth from US$36 trillion in 2008 to US$44 trillion in 2009, with the super-rich top 0.1 % increasing their wealth from US$19 trillion to US$23 trillion. Yet the US working class is suffering its deepest and most prolonged jobs crisis since the Great Depression. Fifteen million workers were officially reported as jobless in May 2010, at a 9.7% unemployment rate, apart from 1.1 million discouraged workers and 8.8 million involuntary part-time workers. Their prospects remain dire and dismal with house prices falling again, looming cutbacks in state and local budgets, and European troubles cutting further into exports. These will mean less jobs, more people losing their unemployment benefits, health insurance and homes, and greater poverty and misery. The jobs crisis is likewise severe in the other imperialist countries. Growth resumed in the 27 countries of the European Union in the third quarter of 2009 but by May 2010 some 23.1 million were still unemployed, a 1.8 million increase from the year before and reaching a record 9.6% jobless rate. The Japanese economy has contracted by more than 5% in 2009 and is being dragged back down to deep recession by deflation and weak domestic demand. As officially reported, unemployment reached 3.5 million in May 2010, at a rate of 5.2 %. The government deficit of the EU-27 countries increased nine-fold from 0.8% of GDP in 2007 to 6.8% in 2009, reaching 801.9 billion euros. Over that period Germany's fiscal situation deteriorated from a 0.2% of GDP surplus to a deficit of 3.3%, the United Kingdom's deficit increased from 2.8% to 11.5%, and France's deficit from 2.7% to 7.5 %. EU-27 debt correspondingly rose to 8.7 trillion euros, equivalent to 73.6% of GDP. The recent 110 billion euro bailout of Greece by the EU and IMF marks the entry into the next phase of the global crisis into sovereign debt difficulties. In 2009, Greece among the weaker European countries had the worst combination of a deficit equivalent to 13.6% of GDP (second worst) and of debt equivalent to 115.1% of GDP (second worst). The bailout requires harsh austerity measures: freezing public sector pay until 2014, increasing the VAT from 19% to 23%, a 10% increase in taxes on fuel, alcohol and tobacco, and increasing the retirement age from 61 to 63. As it is the EU has also already agreed on a 750 billion euro rescue package for other possible bankruptcies in the Eurozone. The number of those in the PIIGS category (Portugal, Ireland, Italy, Greece and Spain) is bound to increase. However, continuing with the fiscal deficits without generating production will some countries). These cuts are being instigated by the IMF which has advised the removal of fuel or food subsidies, public sector downsizing, wage cuts and pension reforms at a time when the populations in these countries are still confronting widespread chronic unemployment, rising prices of food and fuel, and the adverse impacts of climate change. In the backward and dependent countries, incomes from trade, remittances, investments and development remain stagnant and are likely to decrease as the global depression deepens. Decreasing demand from the imperialist countries for primary commodities, migrant labor and low value-added semi-manufactures has led to shut downs and job losses. Trade and budgetary deficits and unpayable debt burdens afflict all the underdeveloped countries. These countries are being pushed further down to ever deepening levels of chronic depression as the imperialist countries adopt austerity measures in their homeground. They will push other countries to do the same, with the notable exception of China which the imperialists have been pushing to upvalue its currency, import and consume more and draw down its export surpluses and foreign exchange reserves. What the Post 9-11 Jobless Recovery Means is, The Post 9-11 Wealthy Followers of Satan and The Post 9-11 Global Satanic Government (The CIA) can continue to Plunder the World, It's People, and It's Enviornment. And anyone who tries to Protest this will be Attacked by THEIR (THE WEALTHY SATAN WORSHIPERS) POST 9-11 COPS (Criminals On Patrol), who are Part of The Post 9-11 Criminals Justice System, which Protects and Serves The Post 9-11 Criminals (who did the 9-11 Attacks to begin with), and NOT The People, who's Taxes Pay their Salaries (The Wealthy Satanic Elite Don't Pay Taxes), and of Course Part of This Post 9-11 Plundering by The Wealthy Followers of Satan is Looting Unemployment Funds by Hijacking them off to Fund Gory Satanic Ritual Serial Murders Abroad, Looting Gulf Spill Cleanups to Fund Satanic Serial Killings Abroad, Using Government Subsidies to Pay for Shipping High Paying Jobs Overseas, etc. in their (The Rich Satan Worshipers) continuing Post 9-11 War on The Poor.